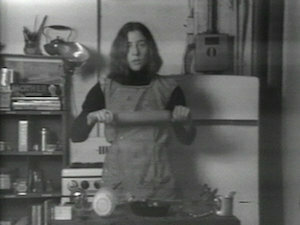 “Semiotics Of The Kitchen” by Martha Rosler is a wonderfully severe, humorous early feminist video about cooking. Part of the collection at the Museum of Modern Art, the video is a performance by Martha Rosler who takes on the role of an apron-clad housewife and parodies the television cooking demonstrations popularized by Julia Child in the 1960s. Standing in a kitchen, surrounded by refrigerator, table, and stove, she moves through the alphabet from A to Z, assigning a letter to the various tools found in this domestic space. Wielding knives, a nutcracker, and a rolling pin, she warms to her task, her gestures sharply punctuating the rage and frustration of oppressive women’s roles. Nope, that would be the Food Network. Here, the video itself is the content. And it is a sharp critique. She takes kitchen utensils, one by one, in perfectly dead-pan delivery, and changes their meaning. You won’t use an ice pick in the same way again,,,nor a ladle! Ms. Rosler made this in 1975. I think the critique speaks to today. I think, we need more. Let me know your reaction.